The BumChum is a new solution to this age-old problem. Thanks to Tactile Generator technology (the kind used in US military simulators, no less) the BumChum boffins have built a throne top which allows drummers to literally feel the bass. It also negates the need for stacks of monitoring gear and can be packed away into a case the size of a 10" tom, and anything that means a quicker post-show packdown is ok with us. We were recently lucky enough to try one out for ourselves, and they work a treat. 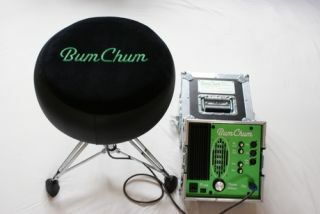 For more information on the BumChum, which comes with a £1,199 price tag, head to www.thebumchum.co.uk.